Jean-Baptiste Oudry (1686–1755), The Lion and the Spider (The Lion and the Fly) (1732), oil on canvas, 189 cm x 253 cm, Nationalmuseum, Stockholm, Sweden. Image courtesy of Nationalmuseum, via Wikimedia Commons. When the viewer already knows the story behind a painting, it makes it much easier for them to read that painting. Stories with which we are all very familiar are fables, whether told by Aesop, La Fontaine, or someone more modern. My quest in this and the next article is to discover when and why painters depicted fables, and – perhaps even more significant – why they did not. A myth is a semi-factual or fictional story involving deities from a mythological system. A legend is a semi-factual or fictional story about a named and famed figure of the vague past. A fairy story is a fictional story about ‘enchanted’ characters in an idealised land. A fable is a fictional story about mainly unnamed characters, often including anthropomorphised animals, which is usually associated with a derived observation about human character or life in general, or a straight moral. Fables exist in every culture, and were among the earliest material to be recorded in written form. Although I will touch on non-European fables, most of my examples (from the Western canon of painting) are considered to derive from an early collection compiled by a possibly legendary Greek, Aesop, who may have lived between about 620-564 BCE. He is believed to have collated several hundred fables from oral tradition, but his writings were lost. They next appeared in a collection of ten books by Demetrius of Phalerum in around 300 BCE, but they too have been lost. The earliest surviving collections of “Aesop’s Fables” date back to renderings in Latin verse by Phaedrus, and in Greek verse by Babrius, in about 50 CE and 200 CE respectively. Since then, numerous translations, mutations, and reinventions have taken place, of which the most famous (and most painted) are those of Jean de La Fontaine (1621-1695). Since William Caxton’s early printed translation of 1484, Aesop’s Fables have been popularly provided with illustrations. Although many of those editions have been illustrated by fine artists, including Gustave Doré, those images have been intended to accompany and illuminate the text. Here I will try to confine myself to paintings which attempt to tell the stories without their text being adjacent. 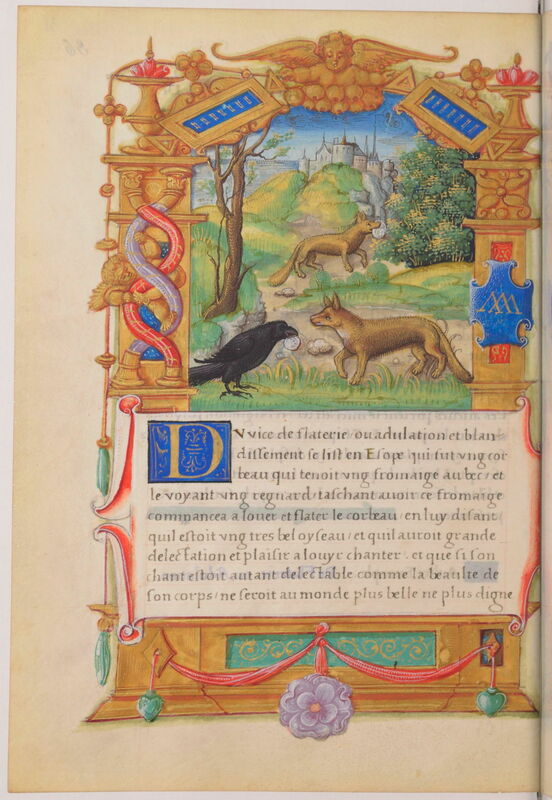 Master of François de Rohan (fl 1525-1546), Flower of Virtue, Vice and Flattery: The Crow and the Fox (c 1530), illumination on parchment, dimensions not known, Bibliothèque Nationale de France, Paris. Wikimedia Commons. Before the advent of woodcut prints, Aesop’s Fables had been popular with those who painted miniatures, here the ‘Master of François de Rohan’, who painted the story of the Crow and the Fox in his Flower of Virtue, Vice and Flattery from about 1530. Surprisingly, I have been unable to find any paintings from the Renaissance which appear to tell these fables, although as they are neither religious nor from mainstream classical Greek or Roman culture, they presumably fell outside the interest of the patrons of the day. It wasn’t really until the Dutch Golden Age that there were a significant number of easel paintings telling stories from Aesop’s Fables. 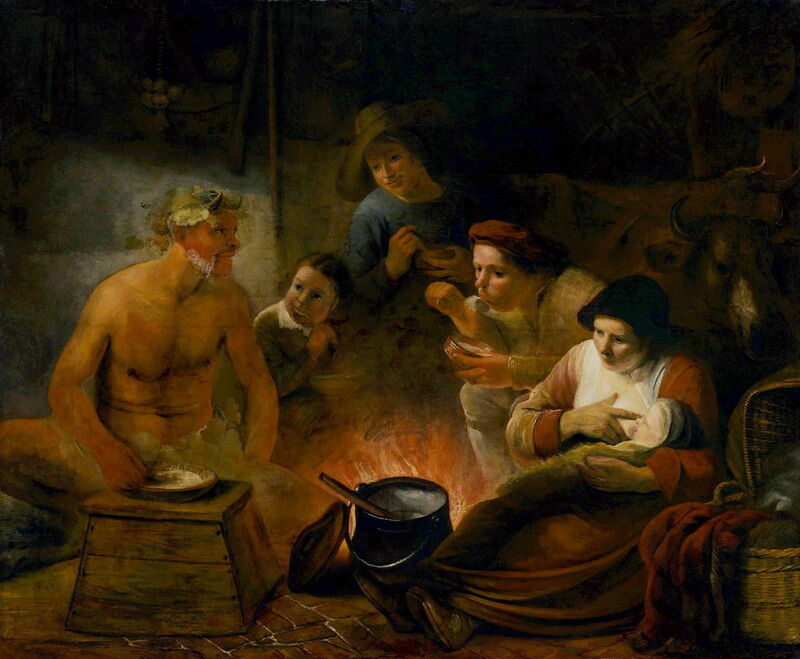 Jacob Jordaens (1593–1678), Satyr Visiting a Peasant (c 1625), oil on canvas, 125 x 96 cm, Muzeum Czartoryskich w Krakowie, Kraków, Poland. Wikimedia Commons. Then, between Jacob Jordaens’ Satyr Visiting a Peasant in about 1625, until late in the seventeenth century, a succession of Dutch painters tackled stories from Aesop. This painting tells the story of the Satyr and the Traveller, or the Man and the Satyr (Perry 35). A man made friends with a satyr; when the man’s hands were cold, he blew on them to warm them up. When the two were eating together, the man blew on his hot food in order to cool it. The satyr couldn’t trust a creature whose breath blew both hot and cold, so broke off the friendship. 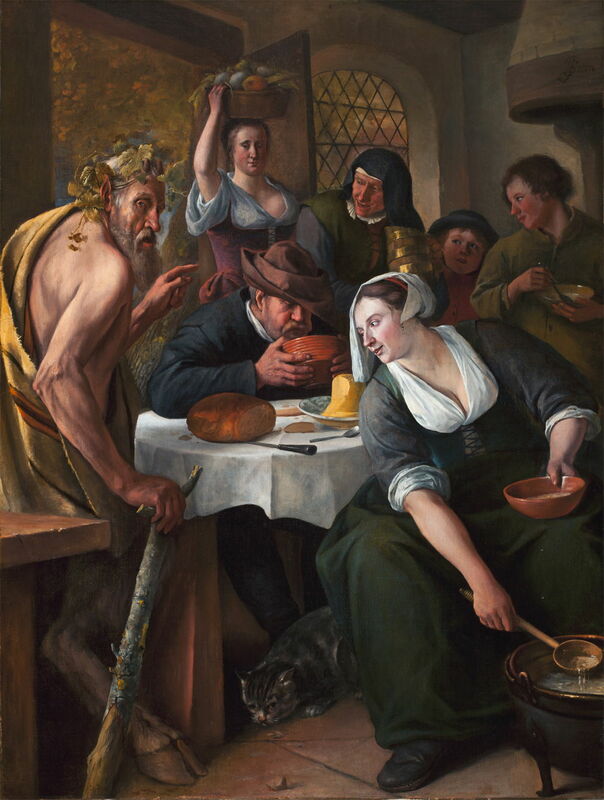 As in the other paintings of this fable from this period, Jordaens shows the satyr at a meal in a family home, presumably when the hot food is cooled by blowing on it, as the satyr is giving his reason for leaving. Frans Snyders (1579–1657), The Fable of the Hare and the Tortoise (1600-57), oil on canvas, 112 x 84 cm, Museo Nacional del Prado, Madrid. Wikimedia Commons. At some time during the first half of the century, Frans Snyders painted the still popular Fable of the Hare and the Tortoise (Perry 226). The tortoise and the hare disputed which of the two was the faster, so agreed to run a race against one another. Although the hare was much faster when running, he laid down beside the path and slept. The tortoise, being aware of his relative slowness, ran as fast as he could, past the sleeping hare, until he won. 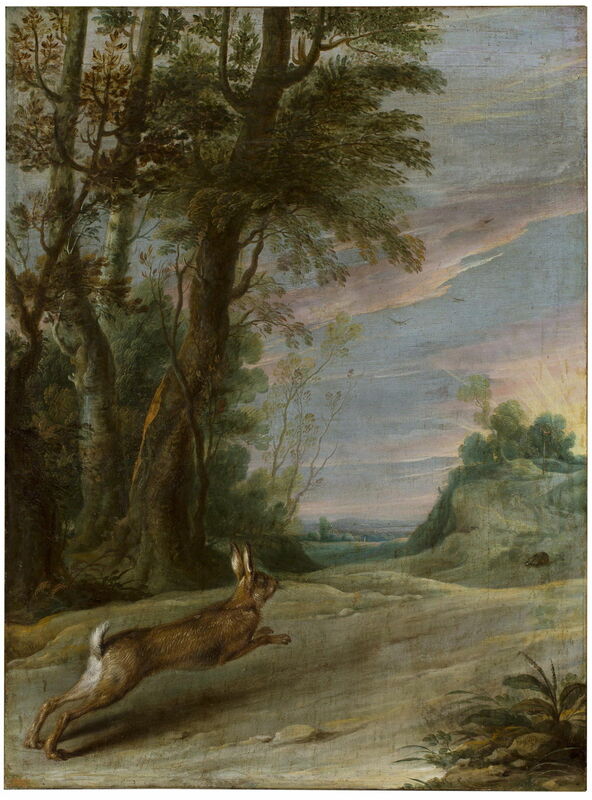 Snyders shows the hare at full pelt, and the tortoise crawling away in the distance, which gives little clue as to the surprising outcome or its cause. Paul de Vos (1595–1678), The Fable of the Dog and the Dam (1638-40), oil on canvas, 207 × 209 cm , Museo Nacional del Prado, Madrid, Spain. Wikimedia Commons. 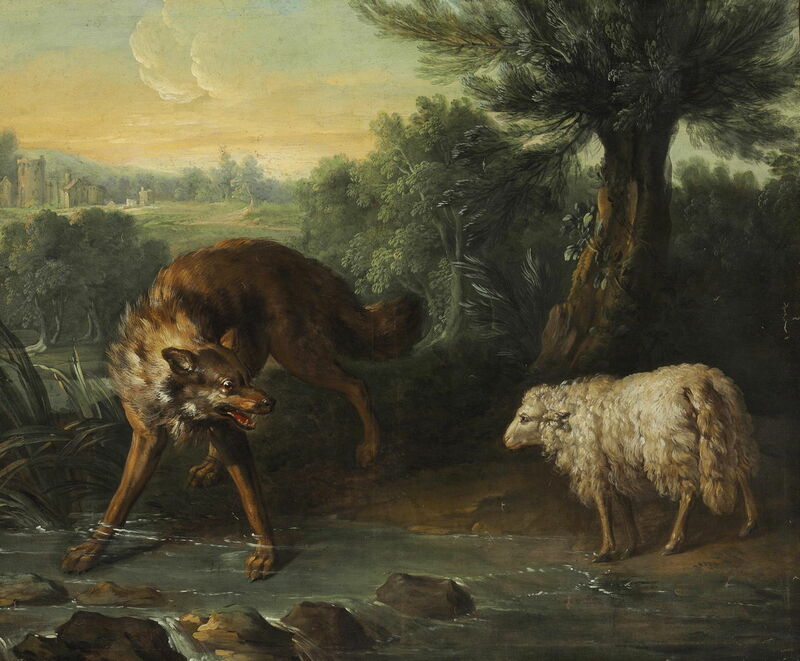 Paul de Vos’s painting of The Fable of the Dog and the Dam from 1638-40 shows a fable known as the Dog and its Reflection, or the Dog with the Meat and its Shadow (Perry 133). In this, a dog acquired some food, such as a piece of meat, and was crossing a stream when it looked down at its reflection in the water. Seeing another dog there apparently carrying better food, it opened its mouth to bark at that reflection, and dropped the food into the stream. 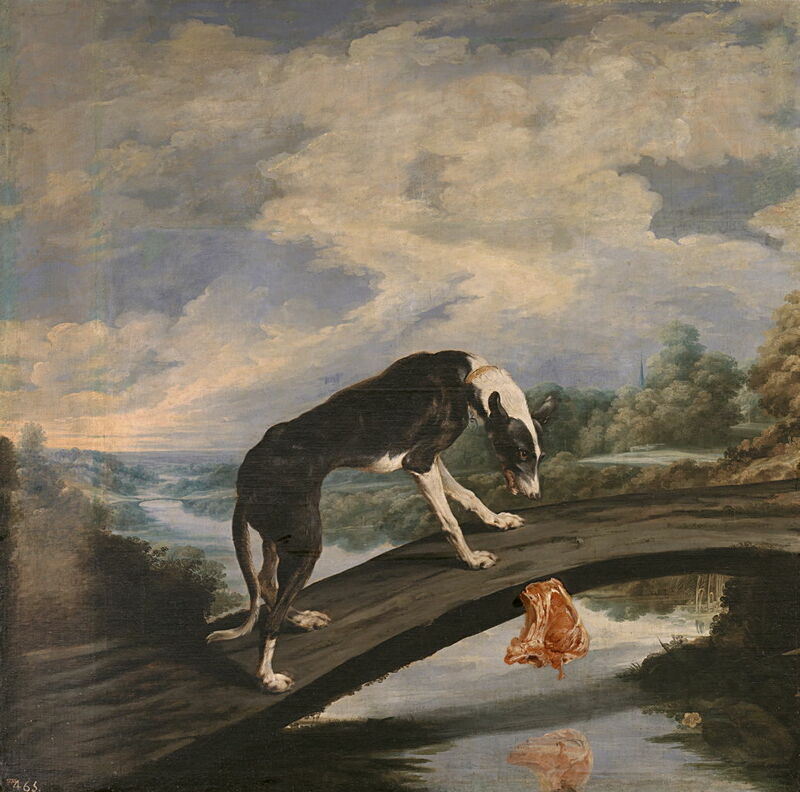 De Vos shows this well, although his inclusion of so much sky prevents the viewer from seeing the dog’s reflection, only that of the falling meat. Constantijn à Renesse (1626–1680), Satyr at the Peasant’s House (1653), oil on canvas, 168 x 203 cm, Muzeum Narodowe w Warszawie, Warsaw, Poland. Wikimedia Commons. In 1653, Constantijn à Renesse, a former pupil of Rembrandt, painted his version of the Satyr and the Traveller, in Satyr at the Peasant’s House. 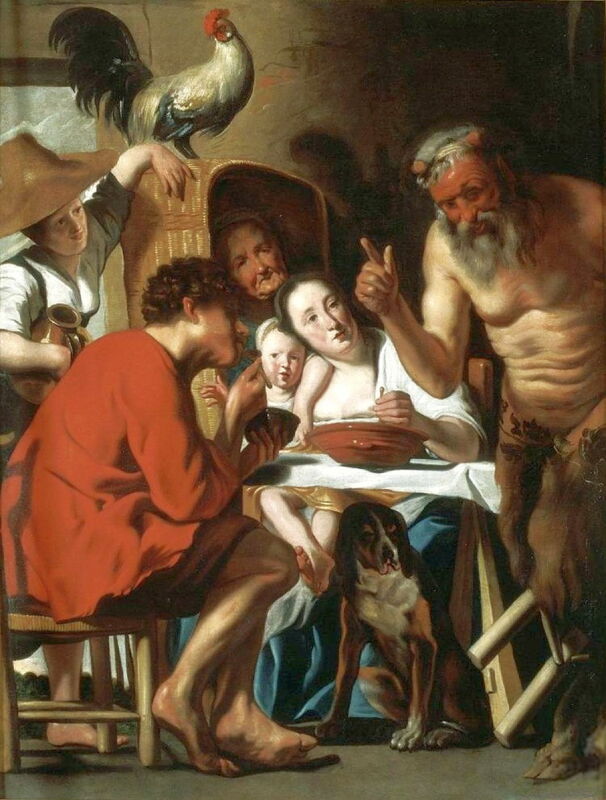 This is perhaps more helpful than Jordaens’ in showing one of the family blowing on the hot food in their spoon, although at that stage the satyr’s reaction is less overt. Jan Steen (1625/1626–1679), The Satyr and the Peasant “Who Blows Hot and Cold” (c 1660), media and dimensions not known, Museum Bredius, The Hague, The Netherlands. Wikimedia Commons. It is perhaps Jan Steen, in his telling of The Satyr and the Peasant “Who Blows Hot and Cold” from about 1660, who strikes the best balance, with a satyr looking quite worried at the viewer, as a man (still wearing his hat) blows on a bowl of hot stew. He also has marvellous attention to details such as the cat skulking under the table, and a rich supporting cast. La Fontaine’s collection of fables first appeared in 1668, shortly after this interest in painting Aesop’s Fables seems to have died away. The next significant paintings of fables seems to have been in the work of the great French animal artist, Jean-Baptiste Oudry (1686–1755). Between 1720 and 1750, Oudry made a set of two hundred drawings of La Fontaine’s fables which were then engraved for an illustrated edition. He also made five paintings, which he exhibited at the Salon in Paris in 1751. 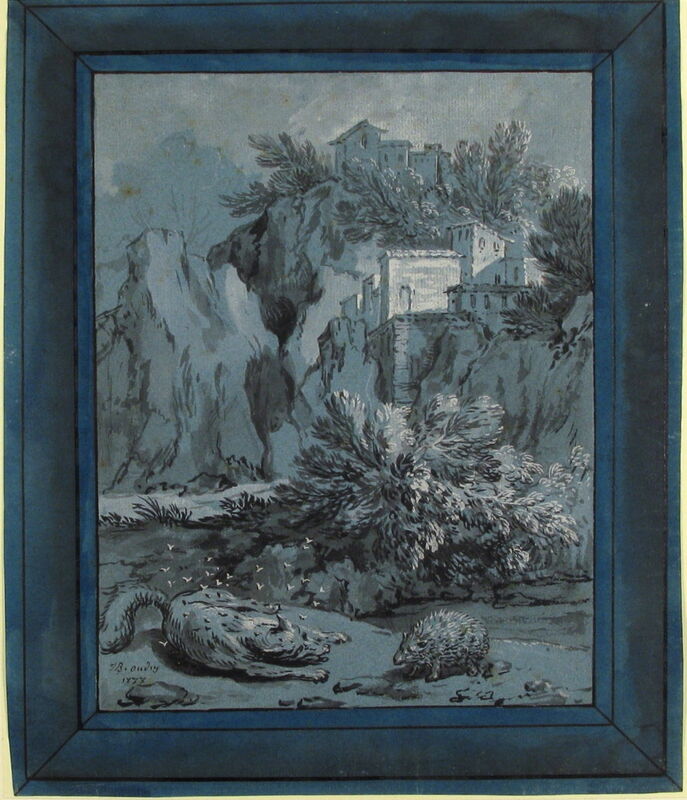 Jean-Baptiste Oudry (1686–1755), The Fox, the Flies, and the Hedgehog (1733), brush and black ink and gray wash, heightened with white on blue paper, 30.8 x 25.7 cm, The Metropolitan Museum of Art, New York, NY. Wikimedia Commons. Oudry’s drawings are themselves well worth tracking down and viewing. This, of The Fox, the Flies, and the Hedgehog from 1733, shows what is also known as the Fox and the Hedgehog (Perry 427, La Fontaine XII.13), and is claimed to have been told by Aesop at a public trial. A fox became enfeebled (in La Fontaine, wounded during a fox hunt), and was being tormented by a swarm of ticks (or flies). A passing hedgehog offered to remove the ticks/flies, but the fox declined, saying that those on him were already gorged with his blood; if the hedgehog were to remove them, they would only be replaced by others who would drain every drop of blood left in the fox. Oudry’s fine drawing demonstrates how much, as an illustration, it relies on the accompanying text to tell the story. One of Oudry’s early paintings of fables, The Lion and the Spider (The Lion and the Fly) from 1732 shows a story which doesn’t appear in Perry’s list or the more popular fables of La Fontaine, although it is included in some more modern collections of “Aesop’s Fables”. A gnat or fly was buzzing around the head of a lion, who became very annoyed as a result. The lion tried to kill the gnat/fly, without success. The gnat/fly stung the lion several times, only making the lion more upset. Defiantly, the gnat/fly told the lion that he wasn’t scared of him, and flew off to broadcast his success – straight into a spider’s web, where he was eaten by the spider. Oudry’s lion is a magnificent beast, and studying the fly’s fate intently. As shown in the detail below, the spider is just reaching the captured fly, and the lion is about to savour his revenge. 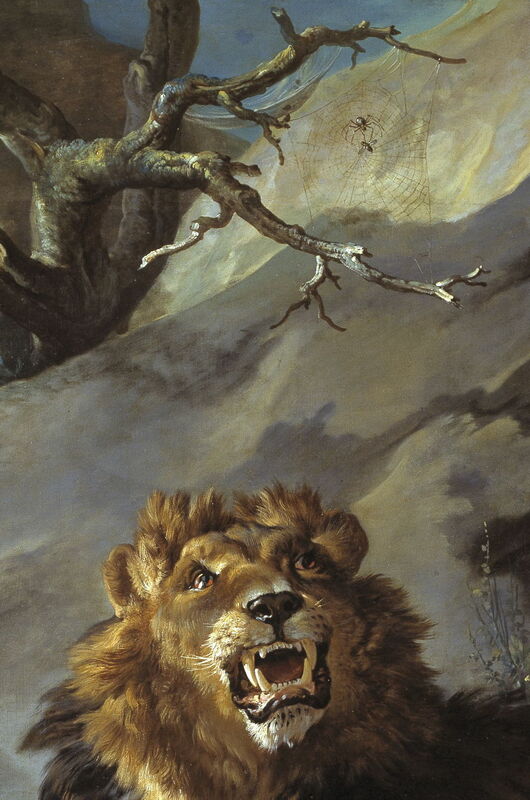 Jean-Baptiste Oudry (1686–1755), The Lion and the Spider (The Lion and the Fly) (detail) (1732), oil on canvas, 189 cm x 253 cm, Nationalmuseum, Stockholm, Sweden. Image courtesy of Nationalmuseum, via Wikimedia Commons. Jean-Baptiste Oudry (1686–1755), The Wolf and the Lamb (date not known), oil on canvas, 104.1 x 125.7 cm , Private collection. Wikimedia Commons. Oudry’s undated The Wolf and the Lamb tells a very popular story (Perry 155, La Fontaine I.10) in which a wolf tries to justify killing the lamb on the strength of its criminal record. The lamb proves each crime claimed by the wolf to have been impossible, so the wolf says that the offences must have been committed by someone else in the lamb’s family, therefore it can proceed to kill the lamb in any case. 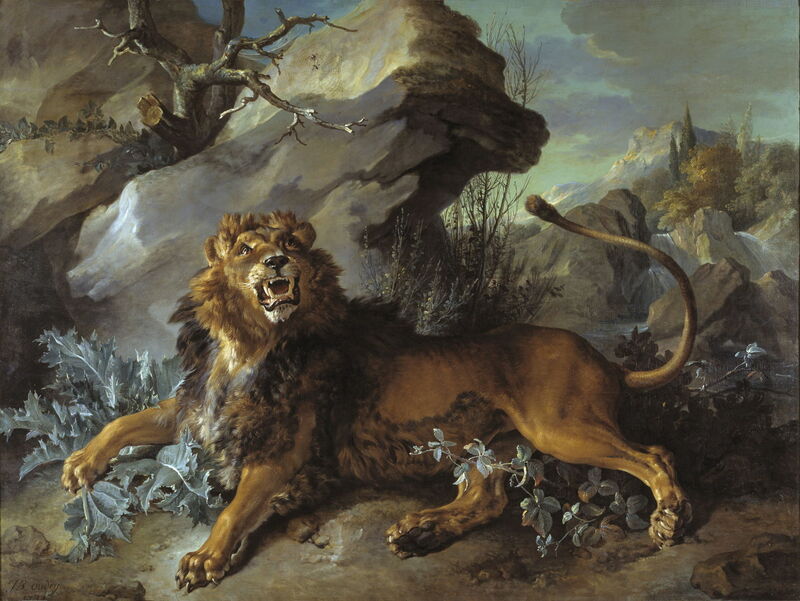 Although Oudry’s animals have superb expressions, this is a challenging story to depict visually, and not one that I would have chosen to try to paint. Jean-Baptiste Oudry (1686–1755), The Fox and the Stork (1747), oil on canvas, 120.5 x 78 cm, Château de Versailles, Versailles, France. Wikimedia Commons. 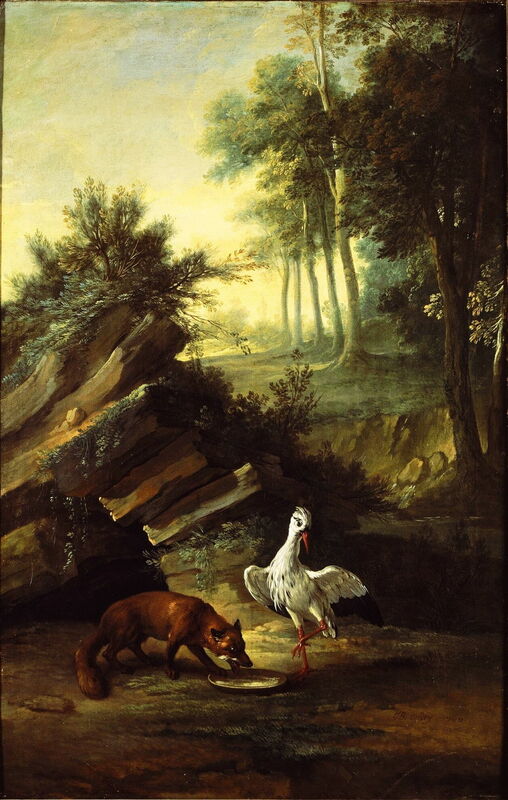 The Fox and the Stork, from 1747, was one of Oudry’s later paintings of fables, and tells the story of that name (Perry 426, La Fontaine I.18). A fox invited a crane or stork to eat with him, and served the meal in a large open bowl, from the which fox could eat easily, but the crane/stork couldn’t eat at all. The crane/stork then invited the fox to a meal, where the food was served in a vessel with a narrow neck, from which the fox was unable to eat, but the crane/stork could eat well. This is another difficult story to tell in a single painting. Oudry opts to show the first half, but no clue is given as to the sequel. Jean-Baptiste Oudry (1686–1755), The Dog Carrying his Dinner to his Master (1751), oil on canvas, 87.5 x 111 cm, location not known. Wikimedia Commons. One of Oudry’s last paintings of fables, The Dog Carrying his Dinner to his Master from 1751 tells La Fontaine’s fable of that name (La Fontaine VIII.7) which has no direct equivalent in Aesop. A dog was trained to deliver his master’s dinner when the latter was at work, without eating the food that he was carrying. One day, while carrying his master’s meal, the dog was attacked by another dog. He stood and fought for it until other dogs turned up and joined in. Seeing that he was outnumbered, the trained dog offered to share the food out between them, and seized a large piece for itself. 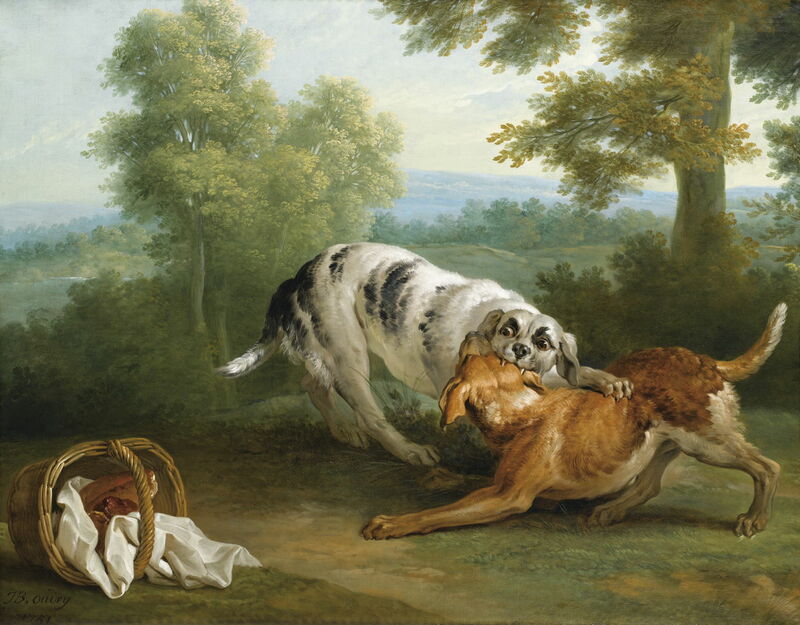 Oudry again tackles a fable which is very difficult to tell in a single painting, and shows the two dogs fighting, with the food basket overturned by them. La Fontaine had directed this fable at those in public office, particularly in city authorities, who defrauded money from public funds – a moral which is completely obscured in Oudry’s painting. Oudry’s fine animal paintings and his illustrations secured his reputation. But those above are not good examples of narrative painting, and appear as dependent on the text as his illustrations are. Fables again became unusual themes for paintings until the nineteenth century, which I will examine in the next article. La Fontaine’s Fables on Wikipedia. Posted in General, Life, Painting and tagged de Rohan, de Vos, Jordaens, narrative, Oudry, painting, Renesse, Snyders, Steen. Bookmark the permalink.